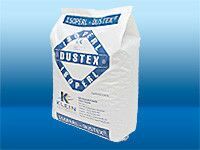 Isoperl®-Dustex® is a grained, heat and sound insulating levelling bulk on a perlite-basis under screeds. Dust-borne with a special emulsion. General inspection approval no. Z-23.11.-1243 from the German Institute for Building Technology in Berlin and quality monitored by the Fraunhofer Institute for Building Physics in Stuttgart. Isoperl®-Dustex® is poured directly onto the cleaned bare ceiling and is pulled level and horizontal with a straight edge or using gauges. When introducing more than 40 mm in thickness, a sealing of 20 % must be considered. Isoperl®-Dustex® fillings introduced in this way must also be mechanically sealed. This takes place by placing switch boards on the cover plates or on bitumen corrugated cardboard and sealing it with a hand beater or a light surface shaker. Then the cement or mastic asphalt coat can be applied. 12 litres Isoperl®-Dustex® per m² of surface and per cm of thickness including 20 Vol.-% sealing. For wet coats, Isoperl®-Dustex® dry filler should be covered with bitumen corrugated cardboard, whereby attention should be paid that the individual tracks overlap by at least 8 cm. For mastic asphalt screeds, cover plates such as fibre plates with a thickness of 8 - 10 mm are placed on the Isoperl®-Dustex® dry filler under consideration of a clean impact edge with joint displacement. The mastic asphalt is then introduced. To make sure that the quality of the Isoperl®-Dustex® dry fillers are not adversely affected, switch boards should be used when sealing and the screed masses placed over laid planks. Installation thickness of Isoperl®-Dustex® and recommended screed thicknesses.